Nitrogen oxides (NOx) released in atmosphere by fuels combustion lead to photochemical smog and acidic rains and have negative effects on human`s nervous system. In this research nanocomposite membranes of Poly Vinylidene Fluoride (PVDF)/ Poly Dimethylsiloxane (PDMS) and Titanium Dioxide nanoparticles (TiO2) with different weight percentage of TiO2 (0.5 and 1) for adsorption of NOx were prepared using electrospinning. To investigate the properties of prepared fibers, scanning electron microscopy (SEM) and Attenuated Total Reflectance spectroscopy (ATR) were used. The fibers morphology and particles distribution in polymer were determined by SEM pictures. The composite fibers with 0.5 wt% TiO2 removed 50% nitrogen oxides and fibers with 1 wt% TiO2 removed 100% of nitrogen oxides. Generally, the presence of Titanium Dioxide nanoparticle (anatase phase) in fibers, vapor and ultraviolet ray have removed toxic NOx gas by contribution in photocatalysis. The ATR spectrum of fibers confirmed NOx adsorption by composite nanofibers. TiO2/ polymer composite membrane showed the promising potential for application as a filter to remove Nitrogen Oxides from air. Nowadays, regarding to industrialization of societies and increasing consumption of fossil fuels, contaminants and harmful gasses have increased in air of metropolises and cities. These contaminants cause global warming, ozone layer perforation, threating human health, etc. Excessive inhalation (aspiration) of these gases can cause respiratory disease and even early death . These problems duplicated in industrial cities. The scientists have looked for new ways to remove these pollutants. Formerly, common methods such as adsorption and reduction of NOx by aminated solvents in the presence of catalyst or adsorption were used to remove NOx. These methods, however, are high cost and time consuming, so, scientists have proposed alternative methods which are cost effective, fast and more efficient. In recent years, removal of contaminants and toxic gaseous nanocomposites has attracted a lot of interest as these materials are cost effective, adaptable and ecofriendly . The direct and indirect effects of nanotechnology on air purification and decrease of pollutants are considerable from different aspects. Nanotechnology offers facilities to produce novel materials, instruments and systems by taking control the atomic and molecular level and utilization of apparent properties which are revealed at this level. Synthesis of nanobiomaterials, nanotubes, nanocomposites, nanofilters and nanoparticles are some examples of nanotechnology employed to solve the environmental issues and prevent air pollutions. There are different cases of nanostructure applications to protect environment; for example, nanofilters for industrial waste water treatment, nanopowders for purification of exhaust pollutants from automobiles and factories, and nanotubes for saving H2 as clean fuel. The extensive use of nanocomposites, nanocrystals, and nanosensors can reduce the consumption of 1.5 billion liters of gasoline per year for vehicles, and decrease CO2 emission to atmosphere by more than 5 million kilogram per year . The concentration of nitrogen oxides, NOx, is measured because of the negative effect of NOx on human health and their contribution in smog and acid rains . In accordance with medical research, nitrogen oxides affect human nervous system and its concentration in blood plasma is measurable. Nowadays, NO (nitrogen monoxide) and NO2 (nitrogen dioxide) are emitted to atmosphere by combustion of fossil fuels in internal combustion motors . One of the efficient methods to remove NOx gas is photocatalytic process of semiconductors. For the first time, Fujishima and Honda discovered this process in 1972, after which many researchers dedicated their investigations to explore the mechanism of photocatalytic performance of TiO2 and other semiconductors[6-8]. Basically, the mechanism of the photocatlytic process is explained by the ability of semiconductor material to form an electron- hole pair under light irradiation, then free radicals are produced which result in secondary reactions . The reaction of free radicals with pollutants in gas or liquid phase degrades them by oxidation or reduction processes . The required energy to produce electron-hole pair depends on the band gap of semiconductor. The required energy to make electron/hole pair in TiO2 with 3.2 eV band gap is provided by ultra violet radiation . Different strategies are used to improve photocatalytic efficiency, such as synthesizing narrow band gap photocatalysts, decreasing electron/hole recombination, and enhancing adsorption ability of photocatalysts. TiO2-saponite nanocomposite was synthesized by solvothermal reaction, and its photocatalytic activity in decomposing NOx gas was investigated. The good NOx removal performance of TiO2-saponite could be related to proper dispersion of titania on saponite surface . Activated carbon fibers are effective for removing NOx in the presence of NH3. They have high surface area and uniform distribution of pores . Carolina et al. (2014) prepared activated viscous fibers (AVF) to remove NO and SO2 . The AVF showed a satisfactory performance in the removal of contaminants and good compatibility with other synthetic fibers. Lin and his coworker prepared nanofibers by electrospinning and adsorbed CO2 gas. The obtained fibers in this research showed the hydrophobic properties. The water contact angle of these fibers was about 140° that reached 150° after modification by AFS. These fibers adsorbed CO2 for 4 days and were reusable . Todorova et al. synthesized TiO2/graphene nanocomposite photocatalyst via solvothermal process. Reduced graphene oxide and surfactant-stabilized graphene were used for preparation of two types of composite and their photocatalytic activity in NOx oxidation, and light irradiation were investigated. TiO2 with reduced graphene oxide removed NOx completely. It could be attributed to separation of electron- hole through interfacial charge transfer . Iron containing catalysts have found applications in effective removal of air pollutants due to their low toxicity and high natural abundance. Carbon quantum dots (CQDs) modified FeOOH nanocomposites showed enhanced NO removal and decreased toxic intermediate generation, due to their effective charge separation in composite . The presence of Pd atoms on surface of TiO2 particles enhances its solar photocatalytic NOx removal. NO removal efficiency linearly increases with the mass fraction of isolated Pd atoms on the surface of TiO2 particles. This improved performance is related to the high resistance of Pd sites to nitrate poisoning . The combination of TiO2 and urea on the activated carbon fibers removes atmospheric NO to harmless N2 . In this project, poly vinylidene fluoride and poly dimethyl siloxane with TiO2 nanoparticles are used to synthesize polymeric nanocomposites for adsorption pollutants. The main goal of this research is removal of dangerous and toxic NOx by spun fibers. The fibers are prepared with electrospinning. To our knowledge, this is the first time that these fibers are studied for NOx degradation. Poly vinylidene fluoride (PVDF) and poly dimethylsiloxane (PDMS) were bought from Kynar and Dow Corning, respectively. Dimethylformamide (DMF) was obtained from Merck. All reagents were used without any purification. Titania nanoparticles with average dimeter of 20 nm were purchased from Pishgaman. Scanning electron microscope (SEM) model EM3200 and Fourier transform infrared spectrometer (FTIR) model Jasco 6300 were used to characterize the composite nanofibers. The lx testo350 equipment was used to determine NOx concentration in air. Producing the nanofibers was done by electrospinning machine in nanotechnology and advanced materials institute (NAMI). This machine was equipped with power supply, syringe and collector. Fig. 1 shows the electrospinning machine. PVDF and PDMS were mixed together in 3:2 weight portions. Then, DMF as a solvent was added to polymeric mixture and stirred till homogeneous solution was obtained. 0.5 wt% and 1 wt% TiO2/polymer composites were prepared with addition of 0.5 w/w% and 1w/w% of TiO2 nanoparticles to homogenous polymeric solutions, respectively, and stirred for 18 hours on magnetic stirrer. The composite mixture was delivered at a constant flow rate (1mL/h) to syringe pump. The distance between collector and nozzle was determined at 20 cm. Upon applying a high voltage (200 kV), a fluid jet was ejected from the syringe. Solvent was evaporated as the jet accelerated toward fixed collector. Charged composite fiber was deposited on collector in the form of non-woven fibers. The fibers of 0.5 wt% and 1 wt% TiO2/polymer composites and polymer without TiO2 were collected separately for 30 min. To investigate the morphology, quality and diameter of fibers and porosity of felt, the scanning electron microscopy (SEM) analysis was used. To investigate the functional groups on surface of nanofibers before and after of NOx removal test, attenuated total reflectance spectroscopy (ATR) was used. To evaluate capability of composite nanofibers to removal of NOx from air, the collected spun fibers during 30 min on Al foil was kept on closed container under N2 atmosphere. Regarding To lx testo350 instruction for use, a device was made by the researchers. Fig. 2 shows this device. This device is a glass made cube with two aligned circle vents. A vent with 12 cm diameter is equipped with a ventilator. The vent with 6 cm diameter is used to stabilize membrane. where Ci is the initial concentration of NOx (NOx concentration in air stream) and Cs is the secondary concentration of NOx (NOx concentration in air stream passed through membrane) and is membrane efficiency in NOx removal or NOx degradation percent. Figs. 3 and 4 show scaninig electron microscope pictures of 0.5 wt% and 1wt% TiO2 containing composite, respectively. Regarding to SEM picture, the fiber diameter of 0.5 wt% composite was between 72.7-109.5 nm, and the made membrane from spun fibers had porous texture (Fig. 3). The diameter of fibers spining from 1wt% TiO2-containing composite was obtained between 60.8- 83.9 (Fig. 4). SEM pictures show that nanoparticles are on the surface of fibers which provide good substrate to photodegradade of NOx. furthurmore sem images reval that the fibers have uniform diameter. The porous texture of membrane makes possible air passingthrough the membrane. The results of NOx removal test are summarized in Table 1. It seems that during NOx removal by TiO2 nanoparticles under sun light irradiation, valance band electrons are excited and transfered to conduct band. Due to this energy transition , a hole is created in valance band and an electron remains in conduct band. The hole in reaction with water vapor produces hydroxyl radicals. Hydroxyl radicals react with NOx and acid nitric is obtained as represent in Equations 2-5. The increase in the amount of TiO2 nanoparticles in composite leads to a better NOx removal because of providing more action sites to adsorb NOx from air and secondary reactions. To investigate and confirm NOx adsorption by spun fibers, the ATR spectrums of composite before NOx removal (Fig. 5) and after NOx removal (Figs. 6 and 7) were prepared. The peaks at 1402 cm-1, 1177 cm-1 and 1178 cm-1 in Figs. 5, 6 and 7 are attributed to O−N and H−N, supporting HNO3 formation and NOx removal by photo induced reactions. We have synthesized the effective membrane to remove NOx gas from air spun fibers. The porous texture of membrane and presence of TiO2 nanoparticles on surface of fibers coopreate for succesful removal of NOx. This research shows the potential application of TiO2/ polymer composite membrane as a filter to purify NOx-polluted air. 1. Reza Abedini MO, Fatereh Dorosti. CO2/CH4 Separation by a Mixed Matrix Membrane of Polymethylpentyne/MIL-53 Particles. 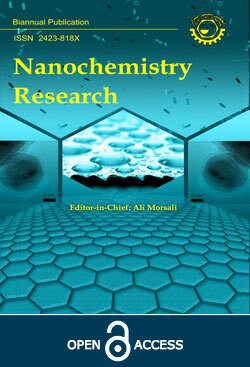 Iranian Journal of Polymer Science and Technology. 2014; 27(14): 337-51. 2. Nan D, Liu J, Ma W. Electrospun phenolic resin-based carbon ultrafine fibers with abundant ultra-small micropores for CO2 adsorption. Chemical Engineering Journal. 2015;276:44-50. 3. Grant L, Schneider T. Organization: Symposium Chairmen. Studies in Environmental Science: Elsevier; 1982. p. 1031. 4. R. Guicherit DvdH. Air Pollution by Nitrogen Oxides: Elsevier Scientific Publishing Company; 1982. 5. Son B, Yang W, Breysse P, Chung T, Lee Y. Estimation of occupational and nonoccupational nitrogen dioxide exposure for Korean taxi drivers using a microenvironmental model. Environmental Research. 2004;94(3):291-6. 6. Fujishima A, Honda K. Electrochemical Photolysis of Water at a Semiconductor Electrode. Nature. 1972;238(5358):37-8. 7. Linsebigler AL, Lu G, Yates JT. Photocatalysis on TiO2 Surfaces: Principles, Mechanisms, and Selected Results. Chemical Reviews. 1995;95(3):735-58. 8. Hashimoto K, Irie H, Fujishima A. TiO2Photocatalysis: A Historical Overview and Future Prospects. Japanese Journal of Applied Physics. 2005;44(12):8269-85. 9. Thiruvenkatachari R, Vigneswaran S, Moon IS. A review on UV/TiO2 photocatalytic oxidation process (Journal Review). Korean Journal of Chemical Engineering. 2008;25(1):64-72. 10. Malato S, Fernández-Ibáñez P, Maldonado MI, Blanco J, Gernjak W. Decontamination and disinfection of water by solar photocatalysis: Recent overview and trends. Catalysis Today. 2009;147(1):1-59. 11. Leary R, Westwood A. Carbonaceous nanomaterials for the enhancement of TiO2 photocatalysis. Carbon. 2011;49(3):741-72. 12. Nikolopoulou A, Papoulis D, Komarneni S, Tsolis-Katagas P, Panagiotaras D, Kacandes GH, et al. Solvothermal preparation of TiO2/saponite nanocomposites and photocatalytic activity. Applied Clay Science. 2009;46(4):363-8. 13. Mochida I, Korai Y, Shirahama M, Kawano S, Hada T, Seo Y, et al. Removal of SOx and NOx over activated carbon fibers. Carbon. 2000;38(2):227-39. 14. Plens ACO, Monaro DLG, Coutinho AR. Adsorption of SOX and NOX in activated viscose fibers. Anais da Academia Brasileira de Ciências. 2015;87(2):1149-60. 15. Lin Y-F, Wang C-S, Ko C-C, Chen C-H, Chang K-S, Tung K-L, et al. Polyvinylidene Fluoride/Siloxane Nanofibrous Membranes for Long-Term Continuous CO2-Capture with Large Absorption-Flux Enhancement. ChemSusChem. 2013;7(2):604-9. 16. Trapalis A, Todorova N, Giannakopoulou T, Boukos N, Speliotis T, Dimotikali D, et al. TiO 2 /graphene composite photocatalysts for NOx removal: A comparison of surfactant-stabilized graphene and reduced graphene oxide. Applied Catalysis B: Environmental. 2016;180:637-47. 17. Huang Y, Gao Y, Zhang Q, Zhang Y, Cao J-j, Ho W, et al. Biocompatible FeOOH-Carbon quantum dots nanocomposites for gaseous NO x removal under visible light: Improved charge separation and High selectivity. Journal of Hazardous Materials. 2018;354:54-62. 18. Fujiwara K, Pratsinis SE. Single Pd atoms on TiO 2 dominate photocatalytic NO x removal. Applied Catalysis B: Environmental. 2018;226:127-34. 19. Miyawaki J, Shimohara T, Shirahama N, Yasutake A, Yoshikawa M, Mochida I, et al. Removal of NOx from air through cooperation of the TiO2 photocatalyst and urea on activated carbon fiber at room temperature. Applied Catalysis B: Environmental. 2011;110:273-8.